Balsamic Glaze For Easy Vegan Food, Veggies and Fruits Alike! 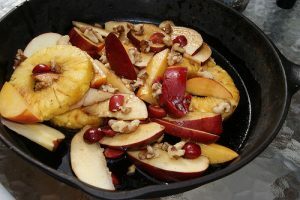 This is my go-to recipe that I use on everything from breakfast scrambles to vegetable stirfry’s, grilled artichokes and even simple tossed salad. Balsamic glaze is a simple, versatile way to turn boring vegan food into a meal that stands alone. 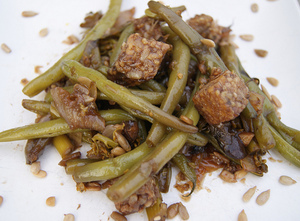 The stir-fry veggie skillet pictured contains 5 cloves of freshly chopped garlic, broccolini, green beans, crimini mushrooms, vidalia onion, white onion and tempeh. I topped with roasted, salted sunflower seeds for added crunch, protein and flavor. I do not add the thickener or rum for typical vegetable meals. Want more dessert ideas? 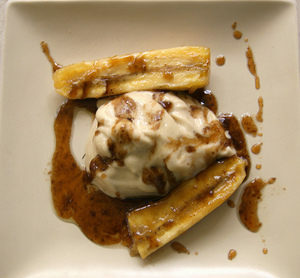 Check out this recipe for vegan bananas foster.